The recording artist Steve Albini once described a particularly onerous music-industry assignment as “a job I wouldn’t wish on a dog I didn’t like.” Right now, I feel like that dog, because I have to review “A Dog’s Purpose.” The assignment didn’t look so bad until about a week ago, when animal rights activists—Or was it TMZ? Or some combination thereof? Who can rightly say?— made public a video of one of the movie’s several dogs balking at performing a stunt, and being mocked for its ostensible cowardice before being forced to act. Instantly, the prospect of two hours of “lookatdapuppy” became the prospect of two hours of “lookatdapuppythatmighthavebeenabused” and seriously, who wants to sit through, let alone offer some kind of objective professional assessment, of that? On the other hand, that girl slapping the cat around in “Satantango” was really slapping a cat around, and somehow I don’t think the horse that was standing on the platform of the wooden staircase that collapsed in “Andrei Rublev” got up and trotted away. Don’t even get me started on that pig in Bertolucci’s “1900,” although I presume he was enjoyed by those who eventually ate him in the form of tasty sausage. 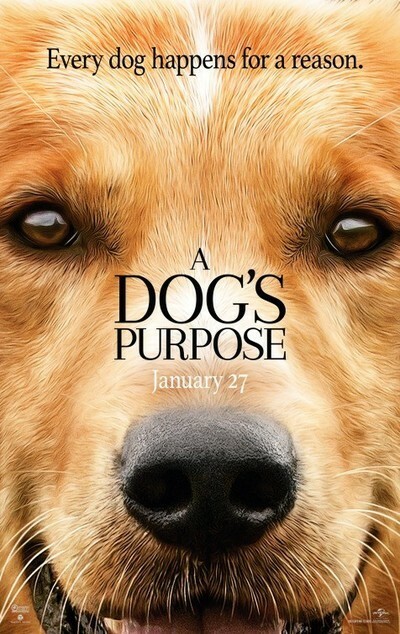 But “A Dog’s Purpose,” directed by Lasse Hallström, who also directed “My Life as a Dog” (not really a dog movie) and “Hachi: A Dog’s Tale” (absolutely a dog movie), is not supposed to be a realistic depiction of the misfortune our differently-individuated fellow creatures fall into in this world. No, it is meant to be an inspirational tale based on the notion that dogs exist to be of service to humans. And that one dog, the one whose voiceover is enthusiastically articulated by Josh Gad, gets reincarnated a sufficient number of times to fulfill the purpose of redeeming the existence of his former master. Then things get real dark real fast. Dad’s hard drinking becomes full-blown shambling and striking-out alcoholism. (This is all the more disturbing since, if you’ve been following the cause and effect action closely, it’s strongly implied that the guy lost his job partially on account of the dog’s bad behavior.) Ethan’s envious, resentful football teammate pulls a prank that causes appalling damage. All of Ethan’s All-American hopes and dreams and optimism are snatched from him, and off he goes to a lonely life at agricultural school. Yikes. Then Bailey dies, and the movie’s next hour is about the different forms the dog takes before finding his ultimate purpose. There’s the German Shepherd police dog (the one in the TMZ video) whose human master is lonesome. This one has the misfortune of having to chase a kidnapper (who’s also an acrobat, given his police-evading climbing abilities) who’s brought his victim to a reservoir, and proves a hero in the noblest and kind of depressing way possible. (And yeah, that water does look damn scary, for German Shepherd or human or whoever.) There’s the ice-cream loving Corgi (I think) who helps find romance for his over-studious mistress (Kirby Howell Baptiste). Then there’s the dog adopted by a rural punk rock chick—they’re the worst—whose neglect is so dire it can barely be voiceovered. But wait! This dog finds freedom, and eventually finds Ethan, who has grown up to look just like Dennis Quaid. Oddly enough, though, he’s not had a girlfriend since Hannah. And so Bailey finds his ultimate purpose. This movie has its moments—no movie with such an adorable array of pooches could not, plus Mr. Quaid, who in addition to being movie-star handsome is also a pretty good actor, sells his fifteen or so onscreen minutes. But the tonal weirdness and the philosophical fallacies and the general level of treacle did not sit very well with me. Then again, I have to admit I’m really more of a cat person.